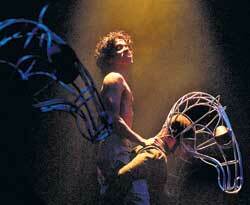 Hiran Abeysekera as Alan Strang in Equus. They still talk – across the dining table, in the theatre foyer, over a cup of coffee – about the first time Equus was staged in Sri Lanka. More than three decades have slipped by, and the play still holds its own, looming large in many memories. Controversial, shocking, so far ahead of its time, Equus was a shot of pure adrenaline delivered straight to the heart of the theatre scene in Colombo. The cast was superb, the production faultlessly timed and audiences responded with enthusiasm – the play was sold out ten nights in a row to great critical acclaim. It’s no surprise then, that the revival of Equus has everyone sitting up straight and paying attention. Presented by the British Council, the play once again boasts a marvellous cast, this time under the direction of Steve de la Zilwa. Rohan Ponniah, who famously portrayed psychiatrist Martin Dysart, reprises the role with Hiran Abeyesekera playing the troubled Alan Strang. The boy’s parents, Dora and Frank are played by Tracy Holsinger and Shanaka Amarasinghe. Subha Wijesiriwardene is Jill Mason, Ranmali Mirchandani is Hesther Salomon, and Janice De Zoysa is the nurse, while Dominic Kellar plays Harry Dalton. The result is unsettling to say the least. A series of gut wrenching, incendiary encounters between the middle aged psychiatrist and the stable boy produce for the audience a bewildering range of explanations for Alan’s bizarre obsession with horses. By the end, the two will traverse space, time and memory as Dysart struggles to unravel Alan’s motivations and attempts to understand and ultimately, to heal his patient. When Ceylon Theatres presented the Tony Award winning Equus in 1978, Steve counted himself lucky to have been involved with one of the most successful productions in recent history. When the play was revived in West End in 2007, Steve decided to do the same in Colombo. After all, “no local theatre-goer under the age of forty five years [in Sri Lanka] today had seen this production,” he says. The published Equus script is the result of an unusual collaboration between Shaffer, the brilliant John Dexter in the role of director, and John Napier as designer, he explains. His tremendous appreciation for the skill of the three men is manifested in his own handling of the play – which is to deviate as little as possible from that first, iconic presentation. Steve sees Dexter’s vision not only in the minimalist, highly flexible stage set up, but also in the almost cinematic nature of the play. That Equus affords a dramatic visual spectacle is undoubted. The play is a masterpiece of ensemble playing – the cast is on stage from beginning to end, seated in a circle, their attention directing the audience to the action playing out in the centre. The effect is only enhanced by how, at key points, they break out into an eerie humming that will have your hair standing on end. The “horses” themselves are masterpieces of suggestion and symbolism. Shannon Raymond plays the horse Nugget and is credited with choreographing the six horses in the production. With their wonderful masks and raised hooves, the actors use the silhouettes of their bodies to mimic the torso and forelegs of the animals. Watching them, it is easy to appreciate Alan’s strange fascination with the beasts, as Dysart himself seems to do. As the only member of the original cast, Rohan says that he is far more sensitive to such nuances and subtleties in the play. “If it’s played properly, it’s the substance that ultimately comes through, whether it’s 2007 or 1978.” And he is not alone in his determination to bring the play alive for a new generation of theatre goers. It is fortunate that this new generation is well represented in the current cast. For Tracy, the opportunity to play Dora is the realization of an old ambition. “This part is a part I’ve wanted to play since I was 14,” she says. While much of the psychology in the play is no longer quite shiny and new, Tracy sees its handling of mental illness as particularly relevant to Sri Lanka. Especially in a society like ours, showing that you can fight out these demons within you, using words and the help of someone who is trained to do that, rather than resorting to violence is one essential insight the play offers, she says. Published in The Sunday Times, Sri Lanka on October 7, 2007. Words by Smriti Daniel. Tags: Alan, Colombo, Equus, Harry Dalton, Peter Shaffer, Play, Rohan Ponniah, Sri Lanka, Steve de la Zilwa, Theatre, Tony Award, Tracy Holsinger. Bookmark the permalink.